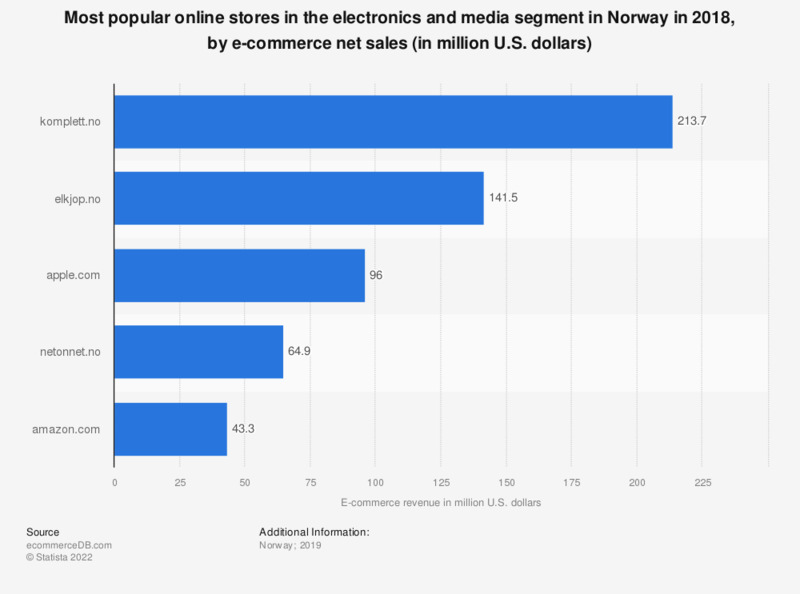 This statistic presents a ranking of the most popular online stores in Norway in the electronics and media segment in 2018, sorted by annual net e-commerce sales. In 2018, market leader komplett.no generated 213,7 million U.S. dollars via the sale of physical goods in the category electronics and media in Norway. The online store elkjop.no was ranked second with a revenue of 141,5 million U.S. dollars. The e-commerce market category “Electronics & Media” covers the sale via a digital channel of physical media (e.g. books, DVDs, CDs, Blu-ray discs, computer/console games), consumer electronics (e.g. TVs, DVD players) and communication devices (e.g. desktop computers, laptops, smartphones, tablets).